An instance of the UIAcceleration class, called an acceleration event, represents immediate, three-dimensional acceleration data. To receive accelerometer events, register an application object as a delegate of the shared UIAccelerometer object, as described in UIAccelerometer. 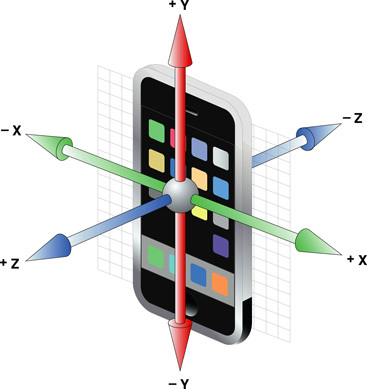 Each acceleration event includes simultaneous acceleration readings along the three axes of the device, as shown in Figure 1. Individual acceleration values are of type UIAccelerationValue, equivalent to a double. Values can range over the accelerations found in normal use of a device. Acceleration event values are approximate—don’t attempt to use them to make precise measurements. Apple recommends that you average accelerometer values over time to derive usable data. If you want to detect specific types of motion as gestures—specifically, shaking motions—use the UIEvent class and its UIEventTypeMotion event type. For details, see Handling Tap and Long-Press Gestures in Event Handling Guide for UIKit Apps. The acceleration value for the x axis of the device. The acceleration value for the y axis of the device. The acceleration value for the z axis of the device. The relative time at which the acceleration event occurred. The amount of acceleration in a single linear direction. The UIAccelerometer class lets you register to receive acceleration-related data from the onboard hardware. As a device moves, its hardware reports linear acceleration changes along the primary axes in three-dimensional space. You can use this data to detect both the current orientation of the device (relative to the ground) and any instantaneous changes to that orientation. You might use instantaneous changes as input to a game or to initiate some action in your application. Important: UIActionSheet is deprecated in iOS 8. (Note that UIActionSheetDelegate is also deprecated.) To create and manage action sheets in iOS 8 and later, instead use UIAlertController with a preferredStyle of UIAlertControllerStyleActionSheet. Important: UIPopoverController is deprecated in iOS 9. In iOS 9 and later, a popover is implemented as a UIViewController presentation. To create a popover, use an instance of UIPopoverPresentationController and specify the UIModalPresentationPopover style.